The Smoking Gold, is an ultra thin, slow burning all rice paper rolling classic. Along with the Smoking Blue the Gold papers are a true Amsterdam coffee shop rolling standard. Roll a joint with the Gold paper it is 100% color free and with natural vegatable gum. 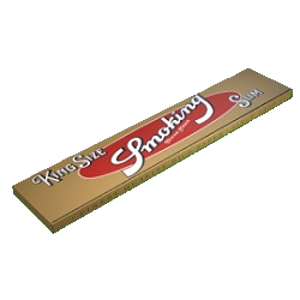 Rolling paper Smoking Gold King Size has "Natural gum" . Natural gum refers to the 100% natural Arabic gum used In the manufacturing of Smoking paper. No chemical colourings or other additives are used, and rigorous controls are in place that guarantee purity and cleanliness. The Smoking rolling papers are made from the pulp obtained from vegetable fibres of textile and arboreal origin. FSC® Certified , ensuring our commitment to environmental sustainability.